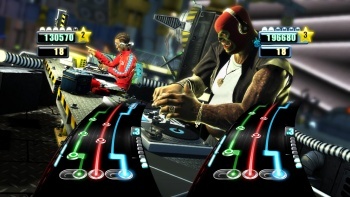 Despite unimpressive sales, Activision is sticking with the DJ Hero franchise and says it will "get it right" with a sequel that's planned for release later this year. Far from heralding the rebirth of the music game genre when it was released in October 2009, DJ Hero flopped. The game sold 122,000 copies across all formats and editions in October, a reasonably respectable figure given that it came out at the tail end of the month, but then managed only 211,000 more copies for the whole of November. The game was well-rated by critics but failed to catch fire with consumers, who may have been put off by its high price, weariness with the music genre in general or the fact that air turntabling remains something of a niche behavioral oddity. Whatever the case, Activision isn't giving up on the franchise just yet. In a GameInformer interview conducted last month, CEO Bobby Kotick pointed out that many Activision-owned developers, like Infinity Ward, Treyarch, Raven and Neversoft, all took time to really hit their stride. "If you're going to make a commitment to doing something original, the odds are that you're not going to get it right on the first chance," he said. "I think DJ Hero is a really innovative product. I can't wait for you to see [this] year's," he continued. "That's the thing; we're sticking with it. We'll stick with it and get it right. But it's going to be less games, better games. That's our strategy." I don't know much about the DJ Hero game, but I do know that when it comes to forging successful franchises, Activision rarely makes a misstep. I was more surprised to see the company recommitting to the series than I was to see it tank the first time around but, with that path chosen, I have to think that there's a reasonable chance Activision will find a way to make it work. On a personal level, it doesn't mean much to me either way - neither the music nor the game are my cup of tea - but is a new and improved DJ Hero something you'd be interested in giving a chance?